Why Take Online Piano Lessons From Music to Your Home? Taking online lessons means no traveling to a teacher’s home, school or studio. No more lugging instruments around town and there are more options for scheduling. Now students in every country and time zone can study with one of our talented NYC music educators and performers. Students are no longer bound by geography! Our cost is lower for online services as travel time is completely cut out. Online lessons are more cost effective than studio or local lessons. Online lessons are available to anyone, anywhere. The only requirements are a reliable internet connection, your instrument and a video chat software such as Skype, Google Hangouts or FaceTime. Music To Your Home provides high quality online music lessons with our amazing NYC teachers using video conferencing systems like Skype or FaceTime. All you need is a laptop or tablet, a webcam and a reliable internet connection and your instrument. Our son Colin just performed in his first Music To Your Home recital. I have to say what a great experience for him and all of us. Dan his guitar teacher is so great with him & our whole experience with this fabulous company has been so positive. We look forward to many more years of playing music with them! Music to Your home found the perfect piano teacher for my sons. He adapted to 2 boys with different learning styles and different musical tastes. He manages to offer each one a personalized lesson and while being fun and friendly, is still capable to be demanding and makes them both study musical theory seriously. As a working parent, the fact that the teacher comes to our home is of course a big plus: one less commute to organize! We love it! Many people aspire to play the piano but they are held back by various concerns. They are concerned lessons will be too expensive and time-consuming. Plus, how do you really know who is qualified to teach you? Music to Your Home is now able to share the knowledge and experience of our incredible piano teachers with students around the world. With our online piano lessons, you will be taught by the very best teachers from the comfort of your own home. You can select your teacher, schedule your lesson, and pay for it online. You want to pursue your passion for music but let’s face it, most days it feels like there just isn’t enough time. This is one of the biggest reasons we are excited to now be able to offer online music lessons. Now, if you have your instrument on hand and a reliable Wi-Fi connection you too can learn how to play the piano. Thanks to our online music lessons, no longer are you limited to only the teachers that live nearby. We know that there are many qualified piano teachers you could choose to work with. However, we believe our teachers truly stand out due to their exceptional skills, training, and the expertise that they bring to each of our clients. When you take online piano lessons, you are free to learn at your own pace as you feel comfortable. This can be especially helpful for younger children who are just getting started with the piano or children who struggle with confidence. Your teacher can recommend the right tools and resources for you to use in between lessons. You have the freedom to choose the material that best suits your needs and interests. 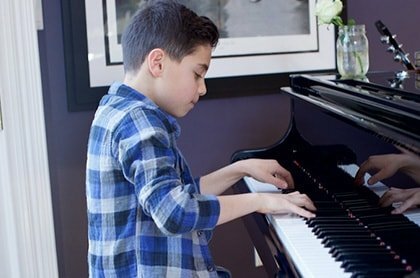 How Do Online Piano Lessons Work? We offer lessons ranging from 30 minutes to an hour in length. You will choose the type of lesson you prefer, pick your teacher, and pay for your lesson online. When you meet with your instructor, they can observe you play and offer feedback on ways you can improve. Your teacher will be able to share resources like sheet music and other tools you will need. We provide convenient scheduling and we always respond promptly to our clients. Contact us today for more information on how to get started.